The primary responsibility of the Wastewater Division is to safely collect, treat and dispose of wastewater, producing recycled water, protecting our environment and safeguarding community health. The Division also utilizes advanced tertiary treatment processes that allow for distribution of recycled water to city customers for irrigation purposes and to Sempra Power Plant for use in their cooling towers. 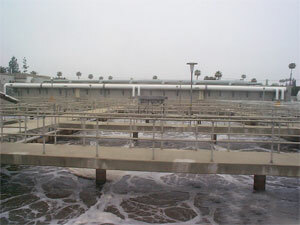 The Wastewater Division operates the wastewater treatment and disposal facility at the Hale Avenue Resource Recovery Facility (HARRF). Approximately 360 miles of pipelines and 11 pumping stations serve as the sanitary collection system for the community's domestic and industrial wastewater. Designed to speed up nature's processes by the use of a controlled environment, wastewater treatment cleanses the wastewater of pollutants. HARRF is currently moving forward with a project to reclaim biogas and reuse it as electricity that will power the HARRF. The Wastewater/Collections Division maintains more than 380 miles of sewer lines, more than 7,500 sewer manholes, 14 miles of sewer outfall line and a pretreatment inspection program for food and commercial establishments. The division keeps the sanitary sewers flowing and clear of obstructions while protecting the citizens and the environment from sewer overflows and backups. Staff inspects, cleans and repairs the sewer system using 3 high-pressure jetting/vacuum cleaning vehicles, a sewer televising vehicle, and various other sewer specific pieces of equipment. The Utilities Environmental Programs Division oversees environmental compliance programs and reporting, including storm water and pretreatment business inspections, storm drain system maintenance and permitting, and water conservation. Additionally, the Industrial Pretreatment Inspection Division inspects food and commercial business establishments for appropriate sewage pretreatment.